It's now time for XBox 360 owners to experience the hit PC game, the Call of Juarez which new single-player modes, improved graphics and also enhanced gameplay and controls to truly set this apart from the PC version. 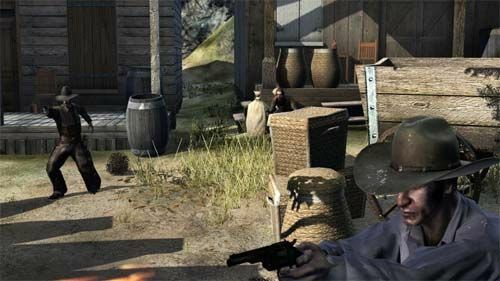 For those that have never heard of Call of Juarez, the game is set in 1882 South Texas where Billy Candle who has just turned 19 is accused of murdering his mother and stepfather. Hot on his trail is Reverend Ray McCall, his stepfather's brother and an infamous gunfighter who believes the Lord has chosen him to be Billy's judge, jury and executioner. With that said, Call of Juarez is an epic western adventure about vengeance, survival and the search for a legendary lost treasure that almost makes this feel like you are living a Clint Eastwood western. 2 Gameplay styles Play as Billy, using discretion to escape the men who seek you. In case of difficulty, use your whip to hit, knock out and disarm adversaries, or simply climb surfaces or grab objects out of reach. Play as Ray and let brute force do the talking - an excellent horseback rider, Ray is also a master of pistol and rifle, and can carry heavy objects to smash down the doors that stand in his way. Multiplayer 18 maps, 5 multiplayer modes and 4 playable character classes. Take part in a thrilling multiplayer experience that includes showdowns in the middle of the town and bank robberies! New single-player modes (Exclusive Xbox 360) 3 new levels playing as Billy – no sneaking and hiding, but in full gunslinger mode! Graphical & technical boost: (Exclusive Xbox 360) HDR textures, more realistic lighting on vegetation, better FX rendering and solid frame rate (40 FPS VS 20 FPS on PC). Enhanced AI (Exclusive Xbox 360) A refined AI provides a realistic gameplay experience, with more reactive NPCs. Players encounter enemies with individual skills, who use their environments to their advantage, employ suppressive fire and work together as a group to shoot them down. Re-Designed Billy levels (Exclusive Xbox 360) Make them more action-driven and rewarding (considered as too slow paced in the PC version). Proprietary Engine (Exclusive Xbox 360) Developed from the ground up for the next-gen console, this allows organic game design featuring open gameplay, intuitive control scheme, realistic interaction with environment, and a fluid, yet sharp, combat mechanic. New music tracks (Exclusive Xbox 360) Further adding to the distinct flavor and atmosphere of the Wild West and spaghetti western are 20 new music tracks. 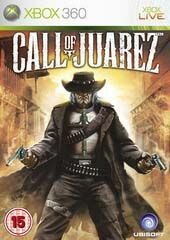 Gamers get to control two characters in the game with interchanging storylines that features Reverend Ray, a preacher who is trying to repent his sins that he managed to gain in his past life and also Billy, an orphan who has been searching for the Gold of Juarez but unfortunately is on the run from Reverand Ray who believes he is a murderer. While Billy's missions do have a lot of focus on stealth, it isn't as good as has been seen in games like Splinter Cell or even Thief, the good thing though is that the game doesn't just have you doing that, you tend to explore more and hear more of the story when the levels are played as Billy, he also makes good use of an Indiana Jones style whip for getting up trees and across rocky gaps. 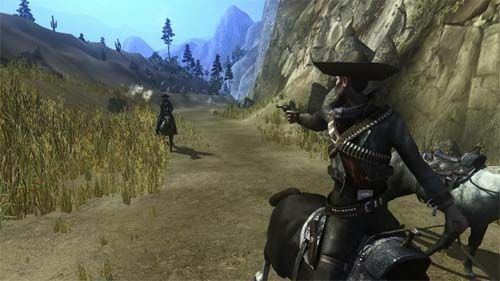 The levels in which you are also riding on a horse or using a bow and arrow are all done with such love of cowboy and Indian movies it is hard not to enjoy them even when there are some annoyances such as relying on quick saves to get you through the levels. Ray's missions on the other hand are more about taking out your vengeance on the people who get in your way, you do so much shooting that the adrenaline just keeps flowing. 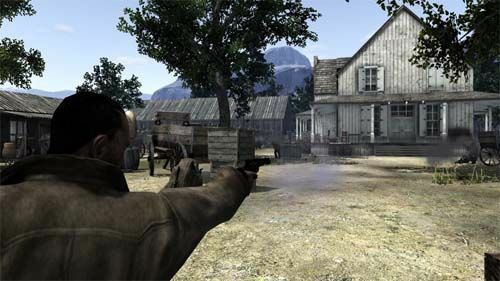 The best feature used in the game though is the Slow-Motion mode that is done when you draw your pistols from the holsters, each pistol then has its own separate aiming reticule, moving slowly towards the center of the screen, each gun gets fired separately with left or right mouse buttons meaning you can take out a whole host of enemies at one time if you can time it right. The game also has many chase scenes, from chasing a speeding stagecoach to rides through and into a mine. There is also a train level which was one of my favorites and even better there are some levels in which you have to actually think about what to do next, something that doesn't happen enough in some of the more recent First Person Shooters. My only gripe with the XBox 360 version is that you are sometimes forced to watch cut scenes which does become annoying, especially if you have seen them before. The control system of the title is perfect on the XBox 360 controller and features good use of the force feedback and has been optimized for the console. We found no faults whatsoever with the control system and there are a few different alternatives if you have difficulty with the main system. The graphics of the title are quite impressive for the most part, although it does have a tendency to look a little shabby in some levels when compared to others. The horse riding scenes are very good and characters faces and design is great. The game seems to use HDR for lighting too, this works quite well in some scenes, especially when moving through mountains and coming out into the sun later in a level. Compared to the PC version, the XBox 360 looks a lot more cleaner and features some stunning environments that look amazing on a high definition TV. Sound is excellent, this is one area that I can't fault at all with the speech being first rate and I have to give my highest compliments to whoever voice Reverend Ray as I felt that his voice work is possibly the best and most fitting I have ever heard in a game and for that praise comes from someone who is usually critical when it comes to voice work. It should also be noted that the XBox 360 version contains new scores to really help immerse you into this title. In conclusion, Call of Juarez is a must have first person shooter, especially for those that are sick of stock standard sci-fi/doom clones. Great story, brilliant graphics and addictive gameplay... this is one title that you really need to check out if you love the genre or have been yearning for that modern Outlaws experience. Definitely a must have for the XBox 360!